The AFC Championship game on January 11, 1987 featured the Denver Broncos, who had topped the AFC West with an 11-5 record, against the Cleveland Browns, champions of the AFC Central at 12-4. The Broncos, coached by Dan Reeves, were benefiting from the continued development of QB John Elway (pictured above), who appeared to be hitting his stride in his fourth year. The running game was ordinary, but young receivers like WRs Vance Johnson and Mark Jackson plus TE Orson Mobley enhanced the passing attack. Key players on defense were DE Rulon Jones, linebackers Karl Mecklenburg and Tom Jackson, and SS Dennis Smith. Denver had gotten off to a 6-0 start but was less consistent during the season’s second half. Still, the Broncos topped the division and got past New England at the Divisional round to advance to the conference title game. Cleveland seemed the hotter club coming into the matchup with Denver. Head Coach Marty Schottenheimer’s team was 4-3 after seven weeks but lost only one game after that. The Browns won their last five contests to close out the regular season with the best record in the AFC and then defeated the Jets in overtime at the Divisional playoff level. They, too, had a good young quarterback in 23-year-old Bernie Kosar, who may have lacked Elway’s mobility but was a fine passer who led the league with the lowest percentage of interceptions (1.9). 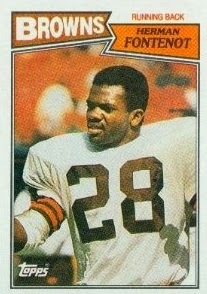 Star TE Ozzie Newsome had suffered through an injury-plagued season, but Kosar spread his passes among several capable receivers, including utility back Herman Fontenot, who had 47 receptions. The ground game was also missing RB Earnest Byner due to injury, but FB Kevin Mack, who also had missed time, was back in action for the postseason. The defense was solid, if not spectacular. Placekicker Matt Bahr had undergone surgery during the season and in his place was 38-year-old Mark Moseley, the NFL’s last straight-ahead kicker who had finally reached the end of the line in Washington. It was an overcast day in Cleveland with nearly 80,000 fans in attendance at Municipal Stadium. The teams traded punts before the Browns put together a 14-play, 86-yard drive. On a third-and-twelve play, Bernie Kosar passed to WR Reggie Langhorne for 13 yards and followed up with a completion to Herman Fontenot for another 13 yards to the Cleveland 38. Kevin Mack ran three straight times for 23 yards and, facing a third-and-seven situation, Kosar connected with Fontenot once again for 24 yards to the Denver 15. The series ended with Kosar passing to Fontenot for a six-yard touchdown. Mark Moseley added the extra point for a 7-0 lead. The Broncos again punted following their next possession, with WR Gerald “Ice Cube” McNeil returning Mike Horan’s 48-yard kick for 18 yards to the Cleveland 37. McNeil fumbled at the end, but DB Chris Rockins recovered for the Browns. However, two plays later Kosar threw a pass that was intercepted by LB Ricky Hunley at midfield that, with a 14-yard return, gave Denver possession at the Cleveland 36. The Broncos were unable to move the ball following the turnover and punted on the second play of the second quarter. Once again Kosar threw an interception, this time by LB Jim Ryan, who ran 26 yards to give the visitors first-and-goal at the Cleveland nine. Denver got to the one in three plays and Rich Karlis kicked a 19-yard field goal to make it 7-3. The Broncos got the ball back quickly when, on Cleveland’s next play from scrimmage, Mack fumbled and LB Ken Woodard recovered for Denver at the Browns’ 37. On first down, Elway was flushed out of the pocket but, despite a sprained ankle, scrambled for 34 yards to the three yard line. Two running plays got the ball to the one and, on third down, Elway, under pressure from LB Clay Matthews, threw an incomplete pass. The Broncos chose to go for it this time on fourth down, and, catching the Browns unprepared on defense, were rewarded when HB Gerald Willhite ran off right tackle for a TD. Karlis kicked the PAT and Denver was ahead by 10-7. The Browns reached the Denver 45 on the next series, with Kosar completing three straight passes for 24 yards to start the drive off, but they could get no farther and had to punt. The Broncos had to punt it back and, starting at their 35, the Browns advanced 53 yards in nine plays. The highlight was a Kosar completion to WR Clarence Weathers that picked up 42 yards to the Denver 20 in a third-and-seven situation. Mack ran the ball twice for a total of five yards and, after Kosar was called for intentional grounding, Moseley came on to kick a 29-yard field goal that tied the score at 10-10 with 20 seconds remaining in the half. The teams exchanged punts to start the third quarter. On their second series, the Broncos reached midfield, but an Elway pass that was originally ruled incomplete was overturned, having been intercepted by DB Mark Harper. Still, the Browns went three-and-out. Following the punt, Denver put together an 11-play, 61-yard series. RB Sammy Winder ran four times for 20 yards and Elway had a completion to TE Clarence Kay for 15 yards and to Orson Mobley for nine, plus another 15 yards added at the end due to a roughing-the-passer penalty. The drive finally stalled at the Cleveland nine and Karlis kicked a 26-yard field goal that put the visitors back in front at 13-10. The Browns responded by going 76 yards in ten plays that extended into the fourth quarter. Kosar had completions to WR Webster Slaughter for 20 yards and Langhorne for 22 to the Denver 38. Mack ran six straight times for a total of 31 yards and the possession finally ended with Moseley once again tying the score with a 24-yard field goal. The teams again exchanged punts until the Browns, starting at their 48 after a ten-yard McNeil return, struck quickly. A pass was incomplete and Fontenot ran for four yards before, on third down, Kosar threw to WR Brian Brennan for a 48-yard touchdown, putting the home crowd in a frenzy. Moseley’s extra point gave the Browns a 20-13 lead with 5:43 left on the clock. Things did not look promising for the Broncos, especially when they started their next series at the two yard line following the squibbed kickoff that was mishandled by RB Ken Bell. Elway threw to Winder for five yards and then, following three straight running plays, Denver was facing second-and-seven at the 15. Elway scrambled for 11 yards and followed up with completions to RB Steve Sewell for 22 yards and WR Steve Watson for 12 to the Cleveland 40. However, another pass was incomplete and then Elway was sacked by NT Dave Puzzuoli, losing eight yards and bringing up a third-and-18 situation. 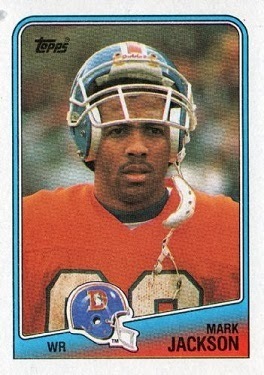 But Elway connected with WR Mark Jackson for 20 yards and the Broncos had a first down at the 28. Two plays later, Sewell caught a pass for 14 yards and, with just under a minute remaining in regulation, the ball was at the 14. Following an incomplete pass, Elway was again forced to run and gained nine yards to set up third-and-one with the clock now down to 42 seconds. Elway, under a heavy rush, threw to a diving Jackson in the end zone for a five-yard touchdown to complete the 15-play, 98-yard series that would henceforth be referred to as “The Drive”. Karlis kicked the all-important extra point and the game went into overtime tied at 20-20. The Browns had the first possession in OT but ran three plays and had to punt. Taking over at their 25, the Broncos gained five yards on a carry by Winder before Elway threw to Mobley for a 22-yard gain. A pitchout to Winder lost two yards and it was third-and-12 after a pass fell incomplete. Once again, Elway came through with a big play as he connected with Watson for 28 yards to the Cleveland 22. The Broncos ran the ball three times to set up a 33-yard field goal attempt by Karlis. While the kick hooked to the left, it passed just inside the upright and was successful. At 5:48 into overtime the Broncos were AFC Champions by a score of 23-20. Denver had the edge in total yards (374 to 356) and first downs (22 to 17). The Browns turned the ball over three times, to one turnover by the Broncos, and were penalized nine times at a cost of 76 yards, to six flags thrown on Denver. John Elway completed 22 of 38 passes for 244 yards and a touchdown with one interception. He also ran the ball four times for 56 yards. Four Broncos caught three passes apiece, with Steve Watson gaining a team-leading 55 yards on his and Steve Sewell accumulating 47 yards. Sammy Winder rushed for 83 yards on 26 carries. For the Browns, Bernie Kosar was successful on 18 of 32 throws for 259 yards and two TDs, but also two interceptions. Herman Fontenot had 7 catches for 66 yards and a touchdown and Brian Brennan, with the long scoring catch, gained 72 yards on his four pass receptions. Kevin Mack ran for 94 yards on 26 attempts. On special teams, Gerald McNeil averaged 12.3 yards on his three punt returns and Mark Moseley, in the final game of his long career, was successful on both of his field goal attempts as well as his extra points. There was no Elway-inspired magic in the Super Bowl, where the Broncos lost decisively to the New York Giants. 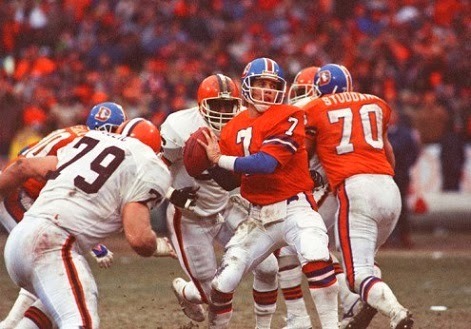 The Broncos and Browns, who again topped their divisions in 1987, met again to vie for the AFC title in a rematch, this time in Denver in a game that the Broncos won thanks to a late fumble by the Browns.